Michigan is blessed with an abundance of natural resources, and the state's environmental quality has vastly improved in the past three decades. All areas of the state are currently in compliance with national ambient air quality standards, and Great Lakes wildlife is thriving, indicating healthier waters. The bald eagle population, for example, increased from just 50 nests in 1961 to 366 in 2000 (see Chart 1).1 Wild trout stocks have likewise rebounded: Hatchery lake trout comprise less than 20 percent of the trout population in Lake Superior, for example.2 Forestland, too, is flourishing, now covering 44 percent of the state. The rate of wetland loss, meanwhile, is in decline. Smokestacks and tailpipes no longer constitute the gravest environmental threats. Billions of dollars invested in new technologies have dramatically reduced industrial emissions (see Chart 2). Indeed, it is proof of our environmental progress that the regulatory focus has largely shifted to more marginal sources of pollution, such as stormwater runoff and dry-cleaning exhaust. More than releases of PCBs, DDT, or lead, the biggest challenges include "natural" phenomenon such as the "invasion" by non-native species of the lakes and inland waters. Washington has long dictated the lion's share of environmental regulation. And while laws such as the Clean Water Act and Clean Air Act have produced results, the costs to the economy, property rights, and state sovereignty have been colossal. In his book "Clearing the Air: The Real Story of the War on Air Pollution," author Indur M. Goklany documents that air quality had been improving prior to federalization-and probably would have continued to improve regardless of costly mandates from Washington. But states like Michigan do have an important role to play as laboratories for more effective environmental policy. This means relying less on the command-and-control regulatory regime that stifles innovation and increases bureaucratic costs in favor of flexible, incentive-based policies that yield greater benefit for every dollar spent. 7. Require legislative approval of major environmental regulations. Environmental concerns understandably rank high among Michigan citizens, and elected officials are, therefore, loath to be perceived as anti-environmental. But voters also are pragmatic, recognizing the flaws inherent in the radical policy prescriptions advocated by many in the green lobby. In juggling these various interests, lawmakers often enact vague environmental statutes that effectively delegate to regulatory agencies an enormous amount of discretionary power. But such regulatory agencies have every incentive to promulgate the most costly and complex rules. (Exacerbating matters is the fact that courts have long deferred to the presumed expertise of agencies such as Michigan's Department of Environmental Quality, even in the absence of statutory authority.) More rational regulation likely would result if major regulations were required by law to undergo legislative scrutiny and win approval before taking effect. Not only would such a requirement restore accountability to the Legislature, it would force the executive branch to prioritize its rulemaking by slowing the proliferation of new regulations. 8. Privatize conservation of public lands. In their report "Progressive Environmentalism: A Pro-Human, Pro-Science, Pro-Free Enterprise Agenda for Change," authors Richard L. Stroup and John C. Goodman describe the dramatic improvements in water quality achieved in England and Scotland after private groups secured from the government exclusive fishing rights in public waterways. Voluntary associations such as the Anglers' Cooperative in England fiercely protect their waters to preserve fishing stocks. But as Stroup and Goodman note, "In this country, virtually all state governments have disallowed private ownership of stream flows on the theory that government should hold these rights in `public trust.' As a result, public streams are often subject to over fishing and pollution." In the interest of improving the condition of inland lakes and streams, the Legislature should authorize a pilot project involving privatization of fishing rights. 9. Neutralize government advantages in enforcement actions. Regulators routinely exercise the option of filing enforcement actions in Ingham County, the seat of state government, rather than the jurisdiction where the alleged violation occurs. This choice of venue poses a disadvantage to citizens because of the increased costs associated with a case being tried far from the defendant's home or business. Moreover, government is shielded from the true costs of enforcement actions and, therefore, is not fully accountable for the number and types of cases adjudicated. Legislation is needed to require that regulatory enforcement actions be filed in the jurisdiction where the alleged violation occurs, unless the defendant agrees otherwise. 10. Eliminate incentives for "urban sprawl" and reform policies that induce urban flight. Continued development and the destruction of wildlife habitat often are cited as threats to the environment. Consequently, a slew of legislative proposals to limit land use are pending in the Legislature, while counties and municipalities across the state are enacting ordinances to restrict development. Yet there is little objective evidence that Michigan is facing a "sprawl" crisis: Less than 10 percent of the state is urbanized, and long-term trends show no dramatic changes in land use. Tax policies should be fair and uniform across the board so as to minimize tax- triggered flight. Siting and other regulatory permitting should be streamlined to reduce the cost of doing business in Michigan and to encourage wealth creation and investment in all businesses and industries, including agriculture. Full or "marginal" cost-pricing for public services and infrastructure should be implemented to avoid indirect subsidization of "urban sprawl." Land use programs should emphasize flexibility and voluntary participation. Property rights must be protected to preserve liberty and rationalize markets and planning. In addition, the redevelopment of core cities would be enhanced were local governments to expedite deed clearance on tax-reverted and abandoned properties by contracting with private experts to clear the backlog and with real estate agencies to return the properties to private ownership. For further information, please see www.mackinac.org/763, www.mackinac.org/3684, and www.mackinac.org/3401. 11. Allow judicial review of all environmental enforcement actions. Several of Michigan's principal environmental statutes prohibit citizens from seeking judicial review of enforcement decisions dictated by the Department of Environmental Quality (DEQ). Regulators have justified their unchecked power by claiming that litigation would delay clean-ups and other remediation orders, thereby endangering public health and the environment. In fact, however, a great many DEQ cases go unresolved for years at a time. And absent the check on its enforcement powers, the agency is insulated from accountability. Establishing the right to judicial review would inject discipline into environmental regulation. 12. Eliminate Michigan's Civilian Conservation Corps. Modeled on Depression-era public works programs, Michigan's Civilian Conservation Corps (CCC) employs some 200 young adults each year for state park maintenance. The majority of recruits are also fed and housed by the state, making program costs per corps member more than $17,700-more than double the amount of per pupil spending in Michigan. Participants who log 1,700 hours also become eligible for a federal education grant of $4,725 (or $2,362 for 900 hours of service). Enrollment suspends all payments due on outstanding student loans, while accrued interest is covered in full by taxpayers. Thus, Michigan families who may be struggling with their own college costs are subsidizing the eligibility of others for federal tuition assistance. The CCC program enables the Department of Natural Resources (DNR) to avoid some of the budget discipline that otherwise requires government agencies to prioritize spending. If the DNR cannot properly fulfill its stewardship obligations absent a corps of federally subsidized workers, perhaps some of the state's vast land holdings ought to be returned to private ownership. 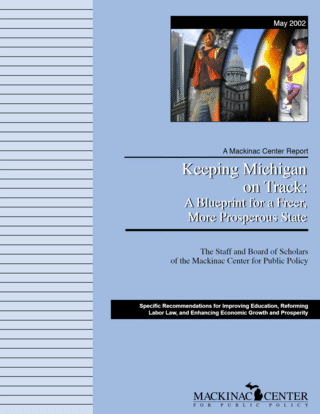 Grappling with the prospect of budget shortfalls, Michigan cannot afford the luxury of such a costly make-work program.